Welcome to the jungle, Miami-style, where fast cars, dirty deals, hot women, and acid-washed jeans all come with the turf. 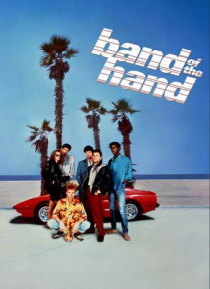 Producer Michael Mann delivers an action-packed dose of high-octane fun in this infamous 1980s crime thriller, BAND OF THE HAND. Directed by Paul Michael Glaser, the cast features awesome performances by future stars Laurence Fishburne, Lauren Holly, Leon, James Remar, and Jam… es Cameron Mitchell. The killer retro soundtrack features the title track performed by Bob Dylan backed by Tom Petty's Heartbreakers. While serving time in a grueling rehab program in Florida's Everglades, five young felons bond together to form an unlikely union. When they return to Miami's dangerous ghetto, the five former criminals wage a lethal war on the drug kingpins who rule the underworld of murder and mayhem. BAND OF THE HAND goes for the jugular, never once loosening its grip until its heart-stopping climax!